Few acts are quite like Le Galaxie. Locally notorious for their late-night festival shows, glowstick showers, shiny stage outfits and thumping dance-pop beats, they’ve evolved where their peers have stagnated. With the addition of an Irish music legend in Mary-Kate Geraghty, have the potential to push the boundaries a whole lot further, despite saying goodbye to major label Universal after just one album. Their sound is euphoric: bleepy and charmingly sing-along, lively and driving. They bounce across the stage, blazing through tracks as if impressing at any individual show is the criteria for ever getting to do another. 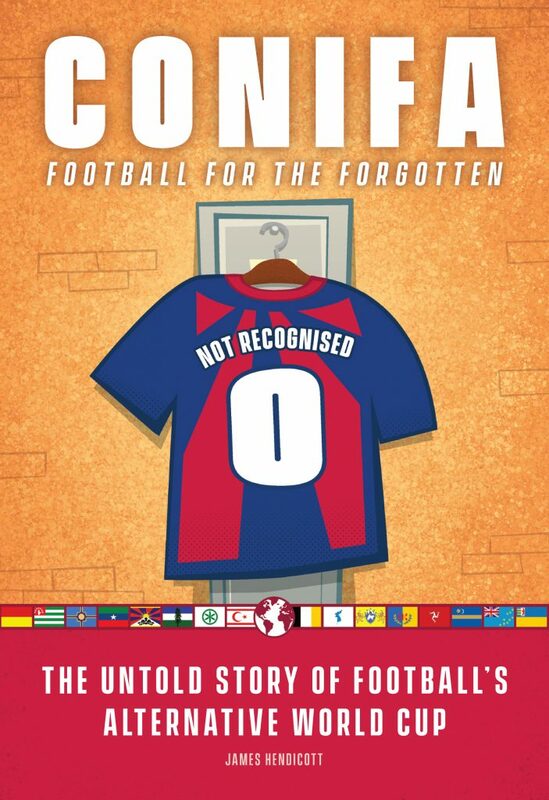 They’ve established a phenomenal depth of local loyalty in Dublin, in part thanks to the constant, lively evolution. It’s personified this time around in Geraghty. 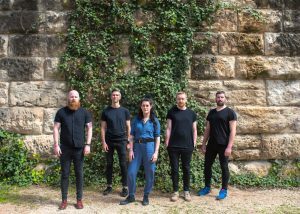 Whilst Geraghty had been fronting Fight Like Apes for most of Le Galaxie’s career, she’s long been a fan, and being part of their latest offering ‘Pleasure’ gives her the outside perspective to see how she fits into their progress. 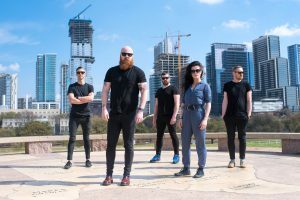 Second Le Galaxie album ‘Le Club’ was released on Universal, a record deal that perhaps looked a little unlikely from the outside, given the band’s fiercely independent nature, but worked out extremely well for them as a one-shot deal. 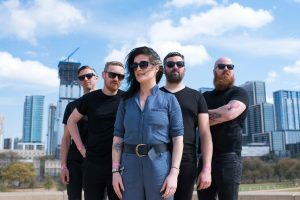 The ‘Pleasure album was already finished when Le Galaxie went on a bit an aside earlier this year and reproduced their own version of ‘Apocalypse Now’ as a promotional event for Smithwicks, something that turned out to be a whole lot of work. “We got vinyl once where everything was backwards. Just a mirror. It was crazy,” Geraghty recalls of her Fight Likes Apes days, laughing. 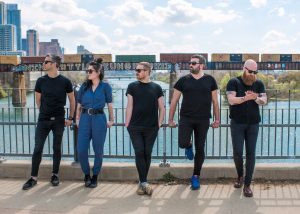 There’s one last aside that has to be made on Le Galaxie: drummer Al Higgin’s propensity for extreme distance running – he often covers a half marathon a day, and has been known to hit triple figures in kms in a single run. As for Le Galaxie, it feels like the laughs are as key as the work ethic. These two might be in the middle of a long press day, but they’re effortless in their love for what they do, joking around throughout, and it suits them. So drummer Al Higgins will continue to show up to practise a few hours after running 24-hour races and batter his drum kit like it’s not a thing. Michael Pope, dressed in a silver shell suit with glitter flashes smeared across his face, will egg on the crowd with glow sticks and triumphant gestures. Mary-Kate Geraghty… she’s a Dublin music icon, and for Le Galaxie, right now she’s their great unknown. 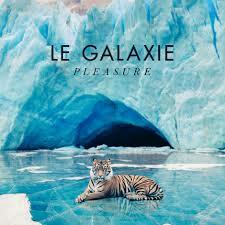 Le Galaxie’s third album Pleasure is out this Friday, April 6. This article is a greatly extended version of my weekly music column for the Dublin Gazette, reproduced here with permission. 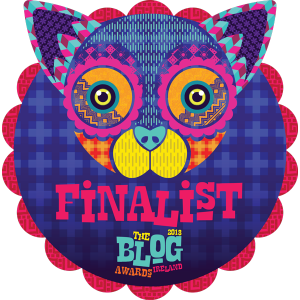 Note: this column is published in the Dublin Gazette several days ahead of on this website. The Gazette is a freesheet paper available across Dublin, published on a Thursday. Pick up copies at these locations.